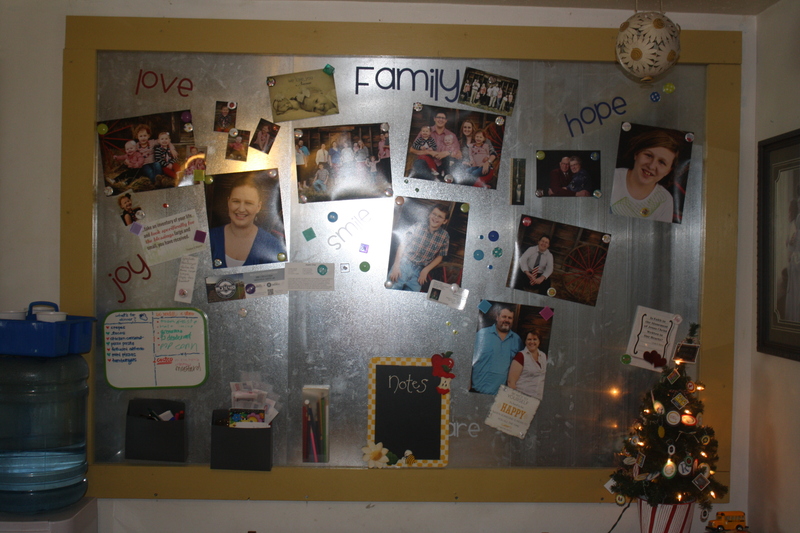 Last year when I came home from a Girls’ Crafting Retreat I found this – A Magnet Wall made for me by my husband and children!! We use this wall to show recent pictures of family members and loved ones and to keep track of a few things!! I love that my husband did this for me!! The wood for the border matches the other painted wall of our kitchen and it took three sheets of metal to cover this area. This happened over a year ago but I am posting about it now because I want to link up over at AmeroonieDesigns.blogspot.com for their Point of Review Reveal – WALLS! Maybe you could come check it out and see what other people are doing to their walls! While shopping in Pebbles in my Pocket the other day during the Pebbles, Inc new logo launch I found this amazing piece of 12 by 12 paper. As I thought of the many possibilities it had I decided to challenge myself to cut it apart and use it to create as many cute items as possible. This blog entry showcases my Takes 1 to 5. So far I have had a lot of fun creating and using this paper. 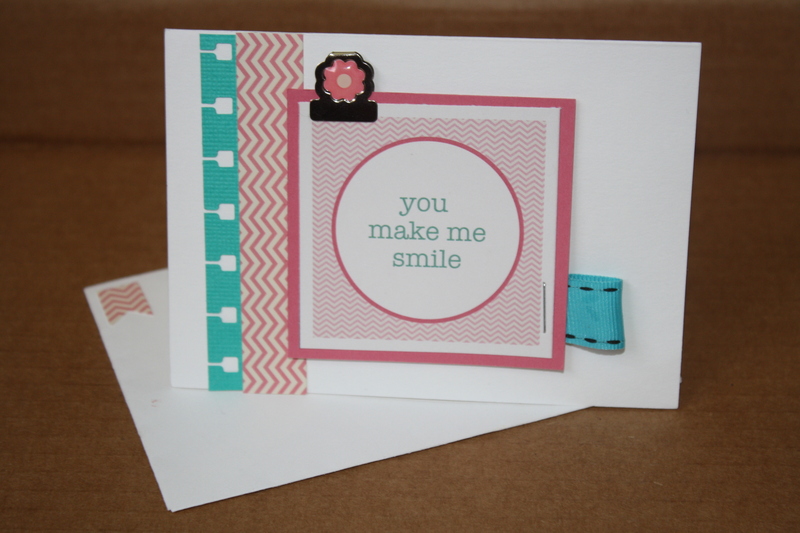 I also have used some of the border stickers from the same collection – Sunny Side. 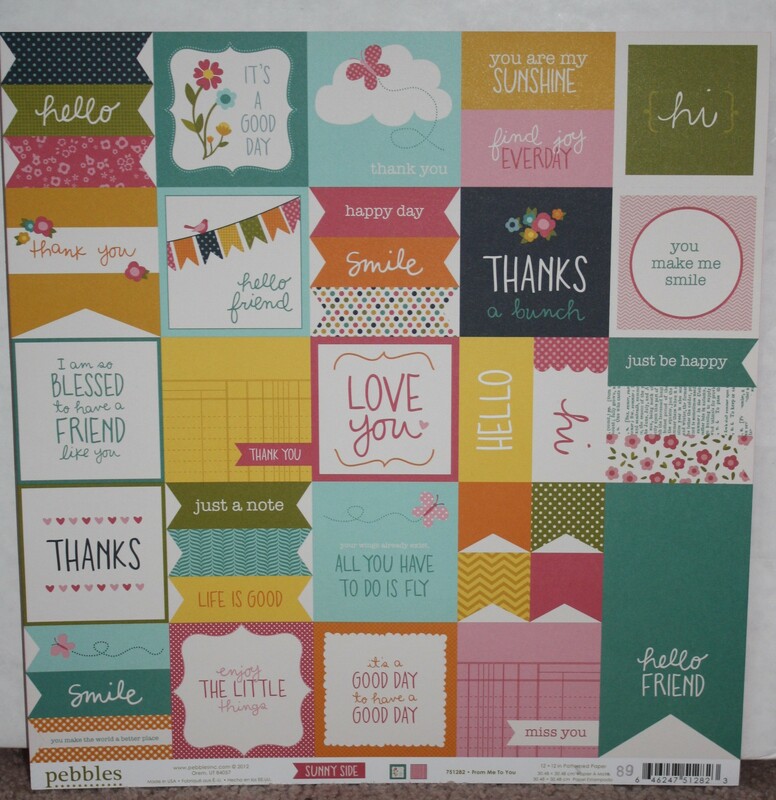 12 by 12 paper by Pebbles, Inc – From Me to You from Sunny Side Collection as it appeared before I cut it apart. I also took a picture of the pieces all laid out so you could see what there was to choose form as I created my projects. 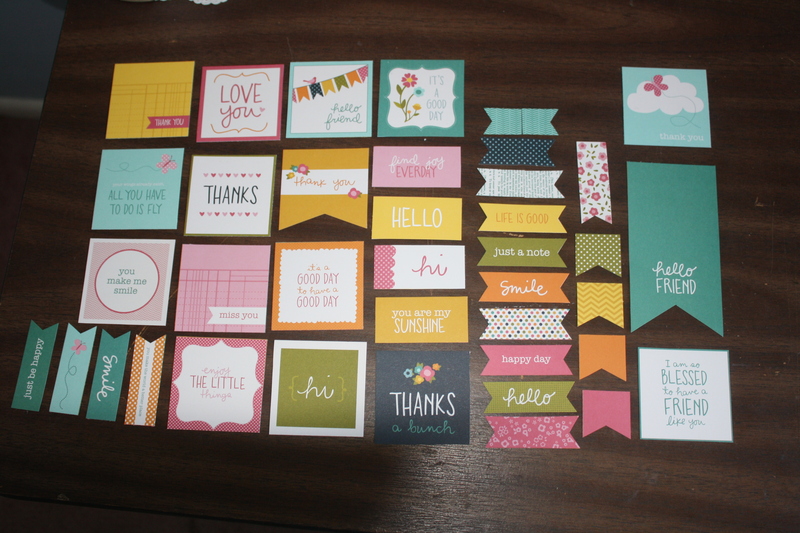 Here are all the pieces that I cut from the 12 by 12 paper – From Me to You in the Sunny Side Collection by Pebbles, Inc.
39 cute pieces in all! Card made from large banner piece and chevron trim from the bottom of the page – pattern appeared on the backside from the label. Used Pool Party twine to put banner together and wrap around the chevron piece. 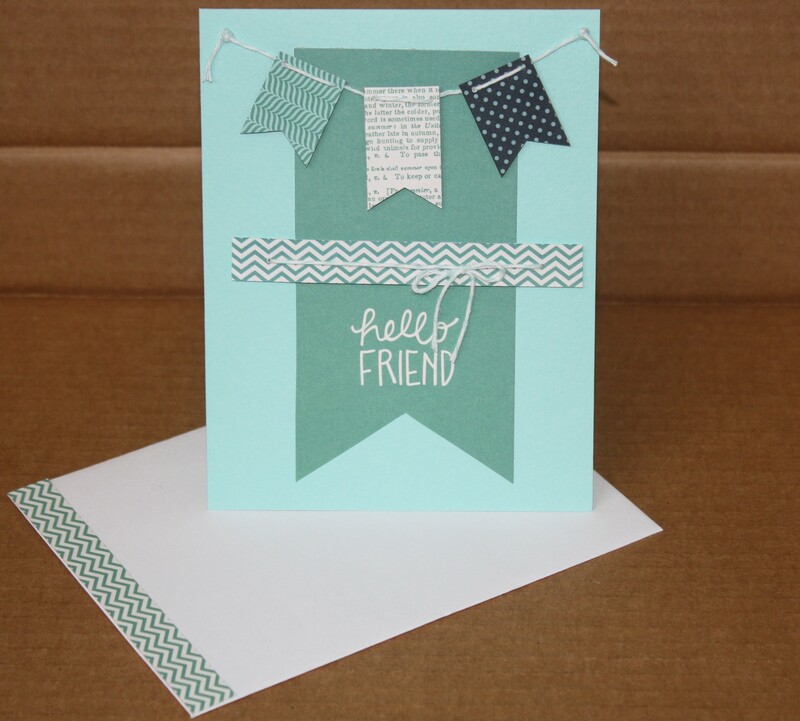 The square with “blessed to have you for friend” sentiment is placed on the inside of the card. 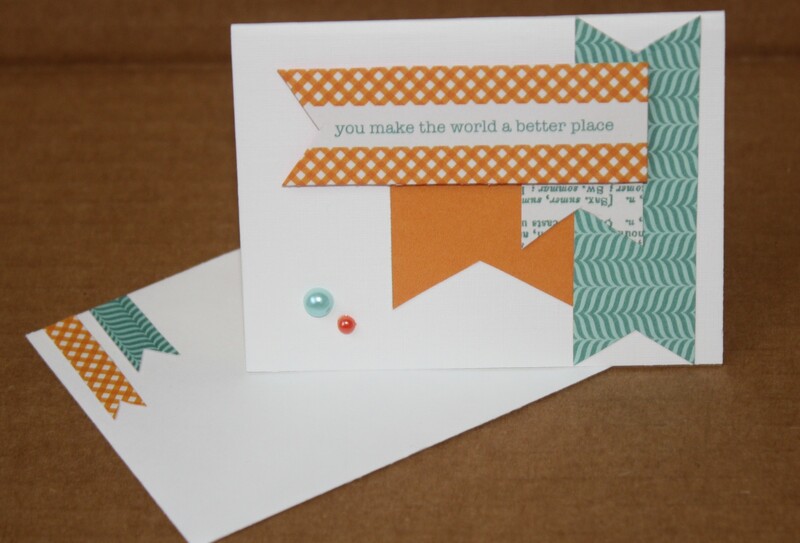 The chevron border appearing on this card is from a border sticker sheet in the Sunny Side collection by Pebbles, Inc. The ribbon is Doodlebug and the metal flower is from Making Memories – both from my stash that I have collected over the years. 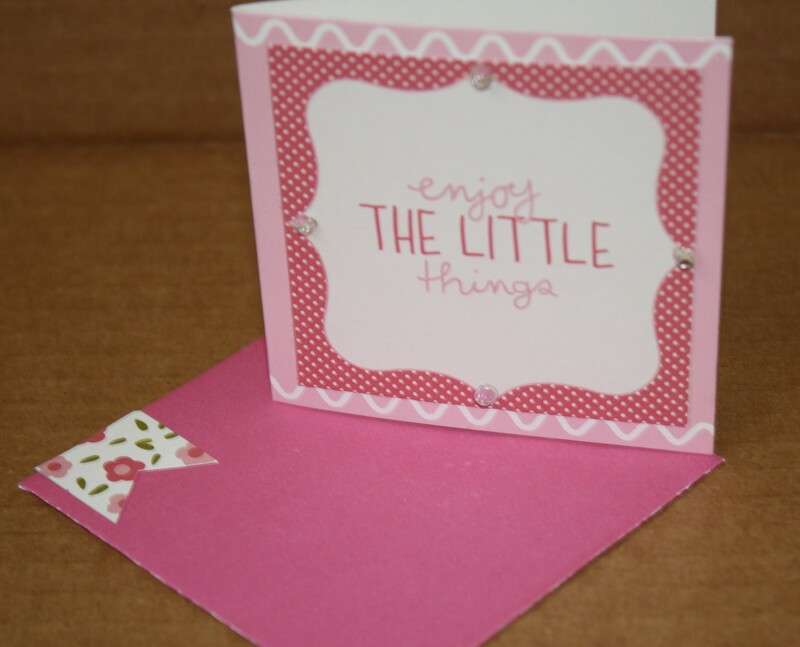 This enclosure card was made strictly from the cutouts save the 2 jewels which are from Doodlebug. Last Easter time I found some 3 by 3 cards at Michaels. The cards featured a butterfly on the front but this square from the cutouts fit very nicely over it and then I added some jewels from PaperSource. The cute pink envelope is from the purchased pack of cards. This item has two pictures to showcase it. 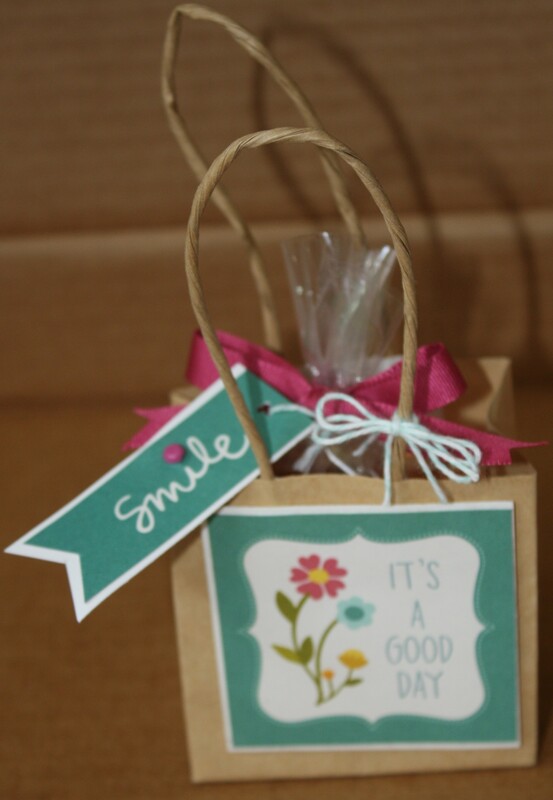 This cute square craft bag was the perfect size for one the cutout squares – Also notice the beautiful matching ribbon from American Crafts, and the Smile banner attached to the cello bag of chocolates. Here is a pic of what the bag looks like with the cello bag in it! Well, what do you think? Did I do good so far using up the pieces of this 12 by 12 paper by Pebbles, Inc.? I had so much fun seeing what I could come up with! I think Take # 1 and Take # 5 are my favorites – which one is your favorite? Leave me some love and let me know what you think!!! I will be choosing a random commenter to win one of each of these projects that I made – Takes # 1 to 5. That lucky person will receive all 5 of the fun projects I made for this post!! (Sorry chocolate won’t be included due to its tendency to melt)Oh, But I will be adding a $10 Target Gift card in with the prize IF my comments # reaches 10!!! I will leave comments open until Saturday, August 10th and then I will post the winner later that day!! Oh, I am so excited – my first giveaway!!! This Giveaway is now closed! I am so excited about this little bit of beautiful cuteness that I had so much fun putting together. 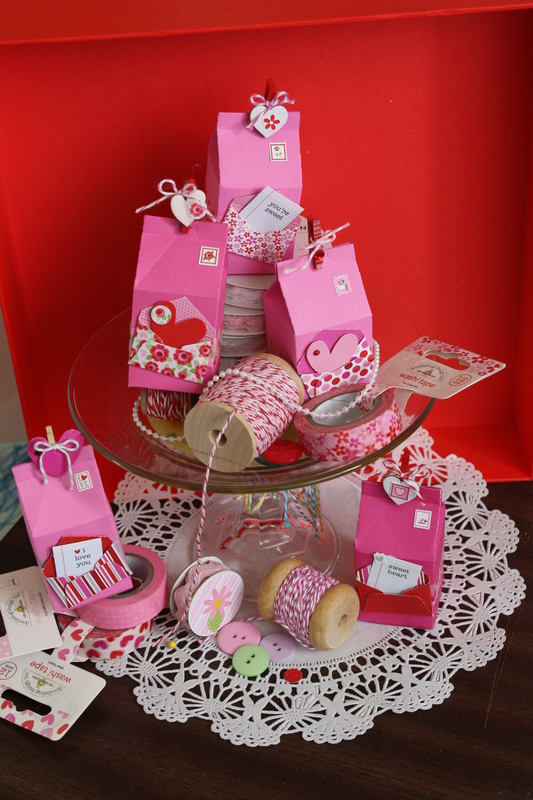 I wanted to showcase the mini Milk Cartons I had made so I grabbed my mini dessert platter and spools of twine, some Doodlebug Washi Tapes and buttons and pearls oh, my! Arranged it all on this doily and there you go. I had so much using my new mini Milk Carton die that I got for Christmas. It makes them so easy! I cuted them up with some mini Love notes that are part of Doodlebug’s Love Birds collection. I will come back real soon and show you more details about the milk cartons themselves! Be back soon! You “Paws”itively make us “Smile”! When you are thinking up a fun way to express thanks individualize it to the person. 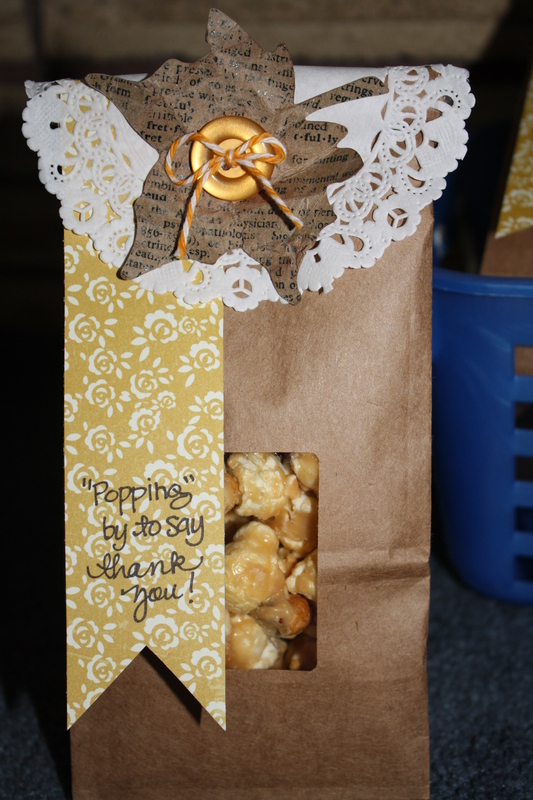 This treat here is an example of a treat made for our Educational Support Professionals (Aides) at our school. Since it was for people at our school I picked blue & gold paper to craft this thank you out of since they are our school colors. The play on the word “Paws” came about since our mascot is a Bengal Tiger and much of our school’s graphics displays paw prints. I had found these simple bright yellow smiley face magnets and 2 of them fit very nicely in the paper pouch I made along with some scrunchies that were , yep – you guessed it yellow and blue. Do you just love the wave of school spirit coming off of this here treat note?!? By stamping a paw print and adding it as an accent I was then able to come up with my corny saying. You “Paws”itively Make us “Smile”!! Ta Dah a treat note with a double play on words! Well, what you see here is what I call a “sour cream pouch”. They are really very easy to make – take a 3″ by 4″ piece of cardstock and fold it almost in half leaving about 1/2″ on one side to put adhesive on and then fold over. Now you have a tube of sorts – at one end pinch it together and staple. Put your items inside of stapled tube. Then take the other end of the tube and fold it the opposite way of the bottom and then staple there also. I used my embellishments to cover up the staple. I don’t know if these instructions make sense but soon I will do a little tutorial with pictures to show how to make it. I know sometimes it just helps to see it done to make sense. This particular blog post is not so much about how to make this item as much as stressing the importance of a little Thank You cuteness! “Pop”ping by to say Thank You! Alrighty then, it is Day 5 of this series. When I was preparing for our school’s Educational Support Professionals (Aides) Week I was in Pebbles in my Pocket trying to channel my creativity for this week of saying Thanks to some wonderful people! I can’t say enough about spending time in this CUTE place – ideas are scattered all through the store and it really gets the “Cute” factor pumped up! While I was there I came upon this project and the project I will be sharing tomorrow. The design for the bag came from Pebbles but the corny saying I came up with. Popcorn sayings are among the highest used on treat notes. I have seen it used in so many ways so in this I wasn’t very original but I think the cuteness of the packaging helped it score points. In doing this project I discovered a love for doilies – they “cute” things up very nicely. In this case a button, and some twine didn’t hurt either, just added to the effect. 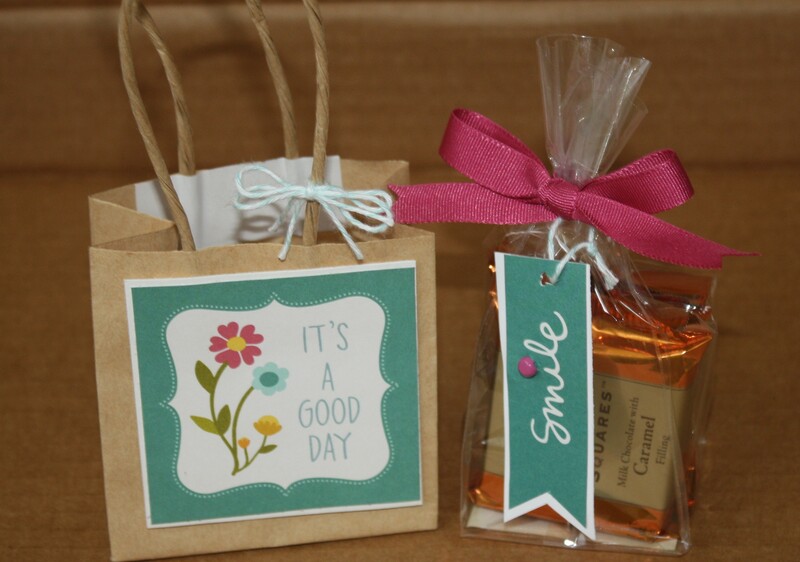 Taking some very simple elements and adding 2 or 3 of them can add up to a very cute, heartfelt Thank You! Years ago a good friend of mine suggested we try tole painting. 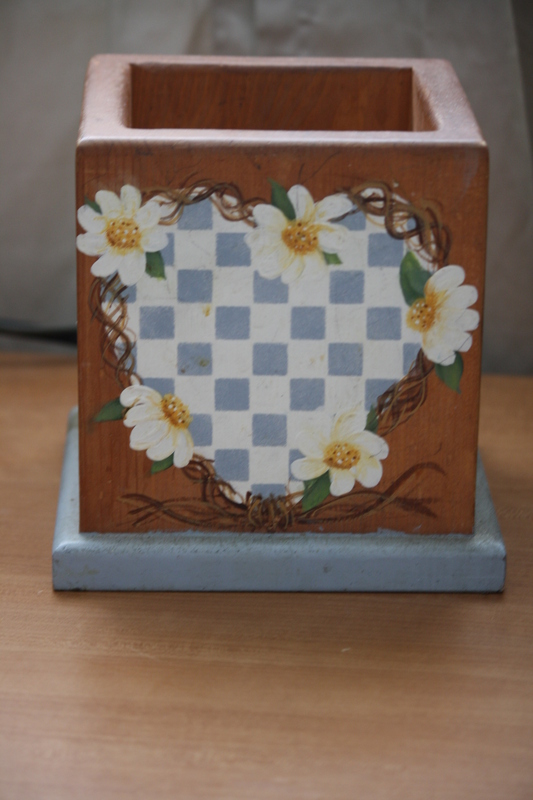 The first project we did was a wood candle box – we used mine as a pencil/pen holder. I was thrilled to discover that the first project had daisies simply because they are beautiful and make me happy. I decided after all these years to take a photograph of it and share how I learned new painting skills while making something beautiful for my home!